Skirts are a wardrobe staple, but with so many choices it's hard to know what style best suits your individual body type. Understanding all the different options and knowing which ones will work for your figure and lifestyle will make the process much easier. The key to dressing for your body type is finding clothing styles that accentuate your figure's positive features. Finding your best assets and showcasing them will help you feel and look great. In addition to choosing the best style for your shape, proportion is also an important component when choosing skirts. It is important to balance out your silhouette. For example, if you are wearing an oversize top, you want to keep it slim on the bottom and vice versa. A mini skirt hits mid-thigh and can vary in how close it fits the body. Surprisingly, a mini skirt can hide a multitude of flaws (especially if it is a fuller cut), but the one thing it cannot hide is your legs. This is the best choice for someone who wants to take the focus away from other parts of their body such as their stomach or arms and highlight their legs. However, it is important that the silhouette is balanced out with more coverage on top and a flat shoe as to not be too revealing. Paired with an oversized t-shirt and flat sandals, this style is a great look for a casual occasion such as a summer barbeque. An A-line skirt is the most universally flattering skirt shape. It has a fitted waist and gradually flares out, hitting just at the knee (creating an A shape). This style skirt is usually made out of a stiff fabric to maintain the shape, such as denim, canvas, leather, tweed or brocade. It is an excellent fit for someone with a pear shaped figure. Worn with a slim turtleneck, opaque tights, and mid-heel booties, this style is a good choice for a creative office environment. A sarong or wrapped style skirt works very well for someone who is trying to take the focus off the mid-section of her body. The style originates from scarves tied over a bathing suit, though designers have adapted the style and translated it to day wear. 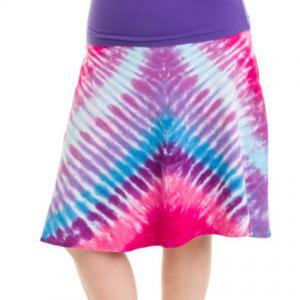 These skirts usually hit the knee and are made out of fluid fabrics with some stretch, like jersey. The cross body draping is very flattering and naturally creates a slimming effect. Try to avoid one that has an actual tied knot at the waist, as that can create excess bulk. Paired with a fitted long sleeve top and a high boot, this would look great at a casual cocktail party. A pencil skirt is a classic shape that is cut close to the body and hits at the knee, usually with a slit up the back. This style works well for someone with a slim, toned figure, as it is not very forgiving. Pencil skirts are synonymous with 'power dressing' as they are often part of a skirt suit, though they can be sold as a separate as well. This is an excellent option for a corporate office setting, especially as part of a suit paired with a silk blouse or thin knit sweater and pumps. A midi skirt hits mid-calf and usually has a fuller shape. The fabric can vary, ranging from soft, flowing silks and crisp cottons to heavier wools. 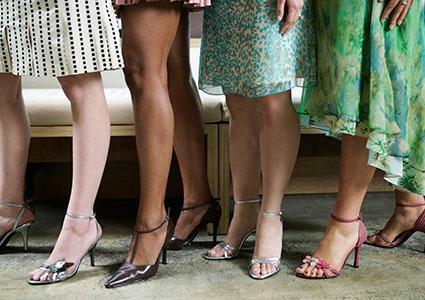 This shape tends to work best for someone who is tall, as the length can be difficult on someone of shorter stature. As the style is often full, this style provides a good opportunity to highlight the waist by tucking in the top and adding a belt. Paired with a tucked in button down shirt, thick belt and wedges, this look is perfect for a weekend brunch or causal dinner with friends. A pleated skirt can be a great choice for someone with a straight, boyish figure. These skirts can range in length from mini all the way down to the floor. There are also a variety of pleats, ranging from very close together accordion pleats to further spaced box or inverted pleats. It is important that a pleated skirt fits well. This style should be fitted around the waist, but there should be enough room that the pleats hang as they do on a hanger and are not being pulled or stretched across the body. Worn with a cropped jacket, fitted tee and kitten heels, this is a great look for a luncheon. 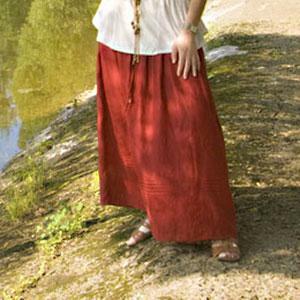 A maxi skirt is a long skirt that comes below the ankle. It is usually cut fairly full, making it a great choice for almost all body types. However, it is important to maintain balance. As there is a lot of fabric with a maxi, its best to pair it with a fairly fitted top. If you are on the smaller side, make sure the cut is not too full as you don't want to overwhelm a small frame. Maxis come a variety of fabrics, often in beautiful printed silks. They are a great choice for an easy day to night look. Worn with a casual tee and flat sandals, it's a great look for day, paired with a silk camisole and heel, it can work very well for evening as well. As you can see there are many different skirt choices to work for all body types. To look and feel your best, find the style that shows off your best assets to the greatest advantage.